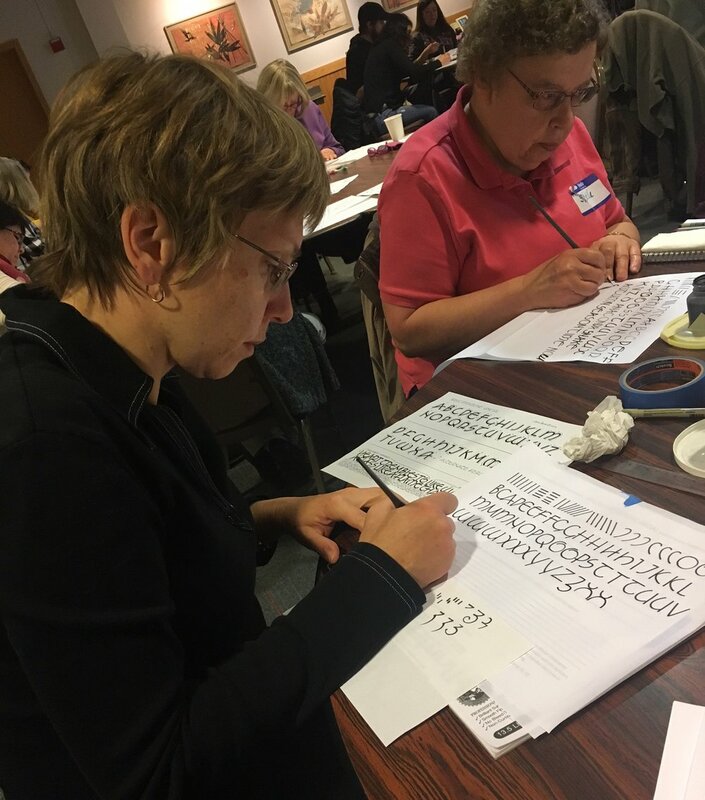 Many thanks to Jean Formo for sharing from her vast stores of calligraphy knowledge at our November program. 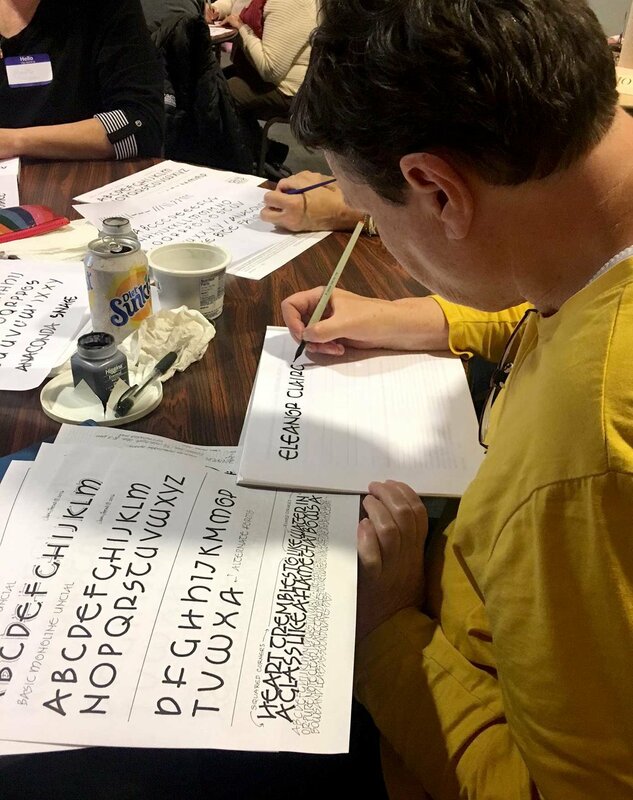 Thirty-five members gathered to learn Jean’s updated take on centuries-old Uncial lettering. Her introductory statement, “We bought ourselves a ticket for the monoline train,” hinted at the twist we would learn that day. Uncial, a book hand used in 300-900 AD, has variable width strokes. Monoline strokes are all the same width. How could these possibly work together? But as Jean showed us, they combine naturally to form unique letterforms that travel well in the here and now while nodding to the past. Jean affectionately characterized the combination as “wacky” and appreciates how conducive it is for contemporary use. Perhaps the open roundness of uncial enables it to contribute especially well to its friendly pairing with monoline writing. Friendly, too, is how one does not need to worry about the relationship of nib width to x-height. 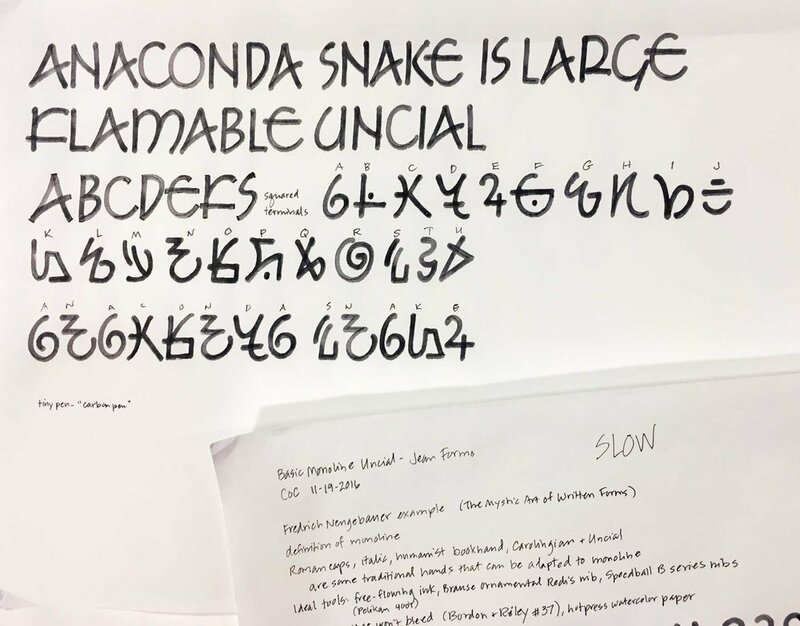 Some of Jean’s inspiration for “Not Your Grandma’s Uncial” came from Friedrich Neugebauer, a 20th century calligrapher and designer and author of The Mystic Art of Written Forms. She highly recommended it and, lucky for us, it is a book that is part of our Colleagues library! Jean recommended a Speedball B-3 nib or a Brause Ornamental Redis 2mm nib, and for paper, anything that doesn’t bleed is fair game. The monoline pen needs a free-flowing ink. Sumi and acrylic inks may be too thick. Pelican 40001 is non-waterproof but works well, as does walnut ink. By using an ink that is not completely opaque, one can selectively increase contrast to make things more interesting. By using a fine point marker, Jean squared off the terminals at varying degrees of sharpness and emphasis. 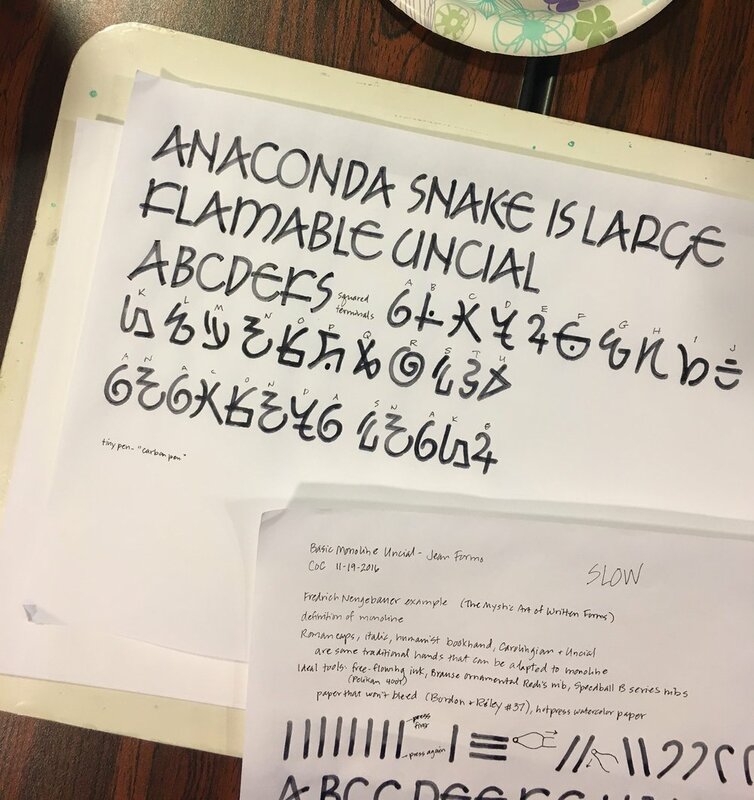 We also were encouraged to incorporate variations of letters that she included on her five-page handout. But at the end, we did the neatest thing. Giving us only a few minutes, she had us create 26 different new marks. We then assigned a letter of the alphabet to each of our new marks. 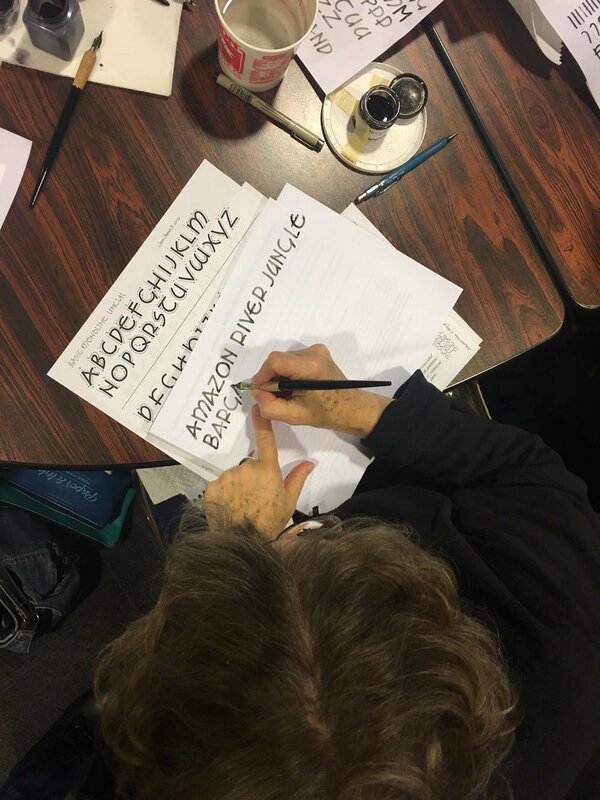 Finally we transcribed a phrase using our new letterforms. 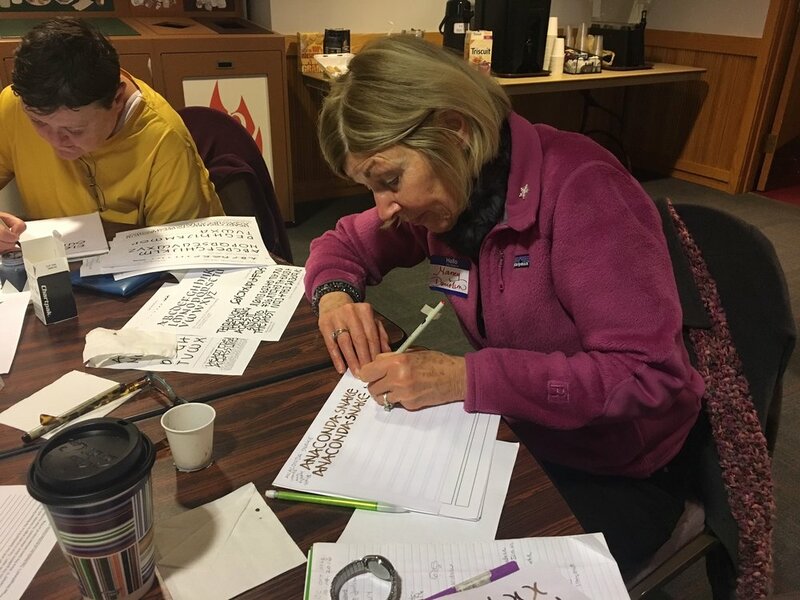 Each person’s was different and the buzz in the room got louder as members enjoyed other’s unique rosetta stones. Because the phrase was unrecognizable, I found myself paying close attention to the counters, the contrast and the overall design of the letters. It was a fun and engaging exercise to conclude the afternoon. Below, enjoy some pictures of the program. And would you consider sharing your thoughts below about these questions? 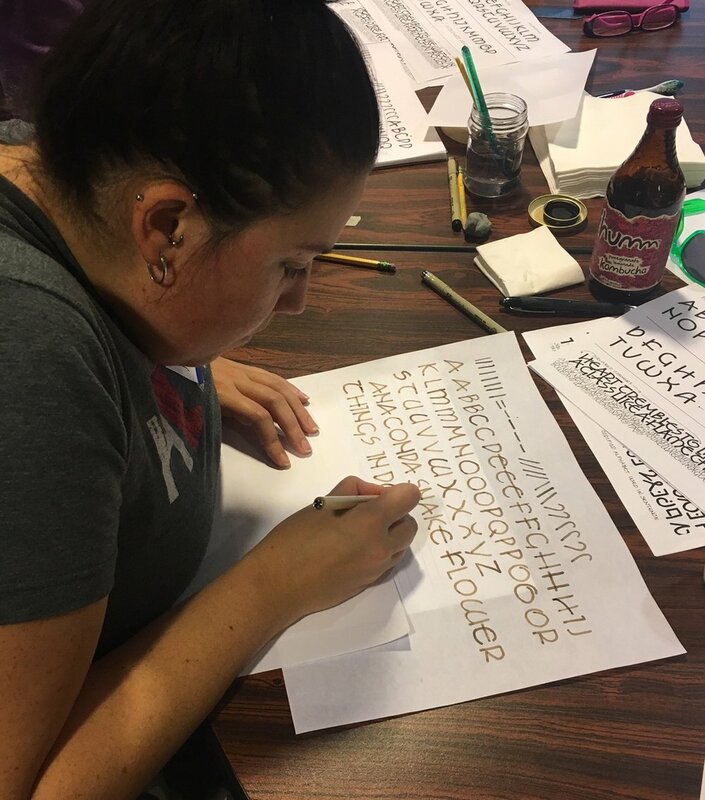 Have you found an opportunity to use monoline uncial in a personal project? What tools have you enjoyed using? Where do you find YOUR inspiration for monoline? It's easy to answer these questions below: simply enter your contact information, write your comment, and click submit. Your comment will post within the day! Interested in Neugeberger's book, or all sorts of other great books to learn from? Click here to check out our library resources! 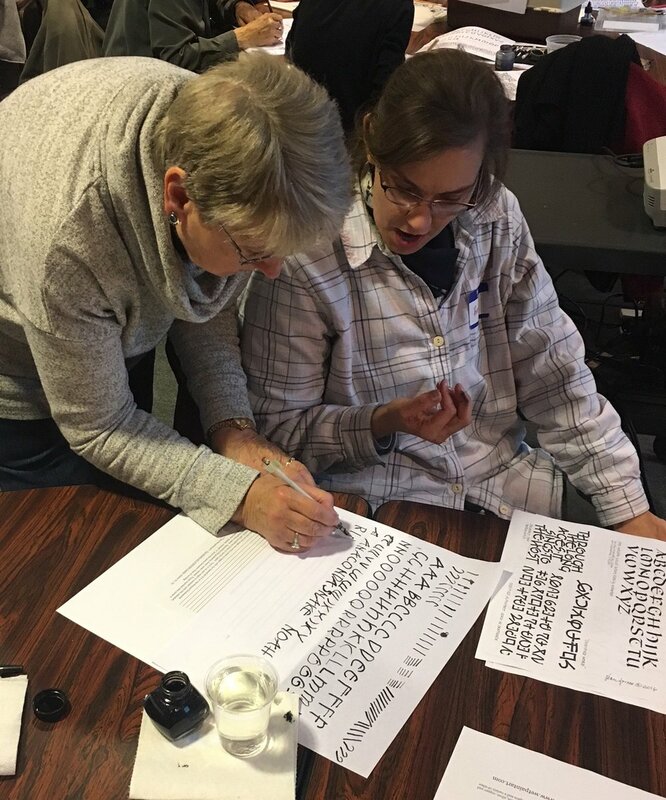 Newer PostFebruary 2017 Workshop Review: Mini Workshops, Maxi Learning!